The definitive version of Hugh Hudson's powerfully unsentimental film set during the American War of Independence. 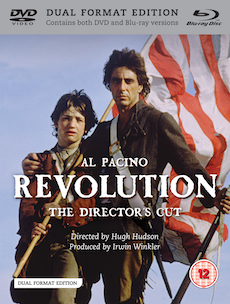 Al Pacino heads a stellar British/American cast (Nastassja Kinski, Donald Sutherland, Joan Plowright, and Annie Lennox) in Revolution: The Director's Cut. The definitive version of Hugh Hudson's (Chariots of Fire, Greystoke) powerfully unsentimental film set during the American War of Independence is a tour-de-force of epic filmmaking. Single father Tom Dobb (played with dogged resilience by Al Pacino) struggles hopelessly against the violent course of history to protect his only son, meeting many obstacles and hardships along the way. Accompanied by John Corigliano's poignant score, Hudson's 1985 film is an uncompromising evocation of the chaos, squalor and upheaval of war which he has re-cut and updated with a new voice over by Al Pacino. Optional presentation of the original theatrical version (Blu-ray only). Original theatrical trailer (DVD only). Re-Cutting Revolution: the Deleted Scenes (2012, 21 minutes, DVD only). Hugh Hudson on the changes he made to create his 2009 cut. Hugh Hudson on Revolution (2012, 12 minutes): illustrated with production stills by renowned photographers David Bailey and Don McCullin. Revisiting Revolution (2008, 23 minutes, DVD only): Al Pacino and Hugh Hudson discuss their vision. Extensive booklet with essays by Nick Redman, Michael Brooke and Philip French.